We love the classic combination of tomato and mozzarella whether it's in an appetizer or salad. So we're big fans of these 25-calorie caprese bites, which make a great snack to keep you satisfied and energized throughout the day. We love the classic combination of tomato and mozzarella whether it's in an appetizer or salad. 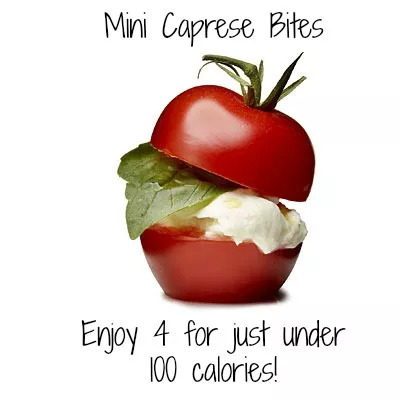 So we're big fans of these 25-calorie caprese bites, which make a great snack to keep you satisfied and energized throughout the day. Cherry tomatoes are rich in potassium and vitamins (A, C, K and B6), and they'll help you stay hydrated since they're made up of 94.5% water. They're also a terrific party appetizer; with just four ingredients, these couldn't be easier to throw together. Ingredients: cherry tomato, basil, mozzarella, olive oil.